You are on an airplane traveling due east at 100 m/s with respect to the air. The air is moving with a speed 35 m/s with respect to the ground at an angle of 30° west of due north. What is the speed of the plane with respect to the ground? Drew the whole right triangle thing to bring down air into its horizontal and vertical components. Vertical turned out to be 17.5m/s and horizontal 30.31m/s. 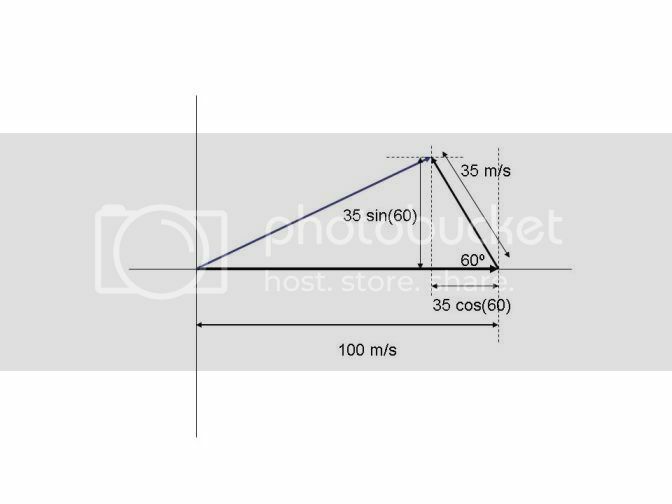 Then I broke up the speed of the plane into its horizontal and vertical components, but I used the same angle of 30 to get horizontal speed of 86.6 and vertical speed of 50. I'm pretty sure this part is wrong. so v[p,g]=86.6+30.31=116.91. That was the wrong answer. I tried subtracting-wrong answer. I even used 60 degrees instead of 30 for breaking up the plane into vertical and horizontal, but that didnt work out either. I have no idea what Im doing. You're on the right track with respect to breaking the components of velocity into horizontal and vertical pieces. It helps to draw out a sketch - see below.